Helpful Nutritional tips to help you prepare for the Paws and Claws 5K on 6.29.13 in Frederick, MD. Join the whole staff from Kingsbrook Animal Hospital to support the Animal Welfare League. Eating healthy can be a challenge even when you are not training for an athletic event, but it is particularly important when you are asking things of your body that it is not used to delivering. If you plan on walking with your dog (unfortunately dogs are not allowed on the 5K run due to the course going through the streets of Frederick), good nutrition for your pup is just as important. We are lucky that a few of the great companies that make our pet foods do all the work for us in regard to formulating a balanced healthy diet that supports all of your pup’s bodily systems. The two companies that we feel have a very strong investment in nutritional research are Hill’s Science Diet and Royal Canin. If you are feeding a good quality dog food that amounts to 90% of the food your dog gets in a day and providing unlimited fresh water to your pet, you are setting a good nutritional foundation. Make sure that the majority of what your dog eats is the dog food because treats don’t have the appropriate nutritional formulation to support his muscles, joints, heart and lungs. Now back to you! Hydration is very important when you are asking more of yourself. Remember that coffee and soda don’t support your hydration status the way water will. Don’t deny yourself the beverages you like, but remember to drink at least 64oz. of water throughout the day in addition to your beverages of choice. If the water can replace those beverages, that’s even better. Physical activity takes a toll on your muscle tissue so it is important to eat enough protein to support your muscles through your activity. Lean meats, beans, nuts and even the occasional protein drink may help boost your protein intake while you are training. Carbohydrates are our fuel but stay away from refined ones that will cause spikes in your blood sugar and result in crashes in your energy level. 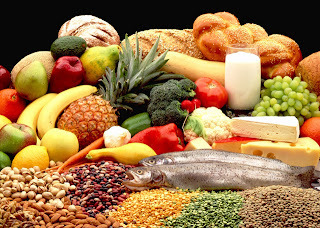 Whole grain breads, fiber enriched whole wheat pasta, fruits and vegetables are great sources of beneficial carbs. The fruits and vegetables will also give you a wealth of vitamins, antioxidants and nutrients you can’t find anywhere else. Keep fats and sugars to minimum because they do nothing for you but satisfy your taste buds. Just remember keep it fun and at the end of the day know that you are going to be healthier and feel better! This entry was posted in Paws and Claws 5K on May 29, 2013 by yourfriends. Hopefully you have heard that Kingsbrook Animal Hospital is participating in the AWL’s Paws and Claws 5K in Baker Park on June 29th. We are very excited because everyone will be there! We are closing the hospital that morning so that all of our staff can participate (doctors, techs, and receptionists!). We plan to open that day after the event at 11am and extend our hours until 3pm. We would love to see you there! If you can’t attend the Paws and Claws run/walk, but want to support us, we are collecting donations for the Kylie and Cricket fund. Money will be collected until the end of race day (June 29th) and if you keep your eyes on Facebook you will see how your donation is helping local Frederick Maryland animals. If you’ve visited our veterinary office recently, you may have noticed all the ‘dogs’ running around our lobby. For each donation we ask that you sign your pet’s name to one of our racing dogs so everyone can see just how generous our clients are! Please consider joining us on race day as we run/walk to make a difference! We appreciate all your help and generosity. This entry was posted in Paws and Claws 5K on May 22, 2013 by yourfriends. What are the benefits of walking or running? 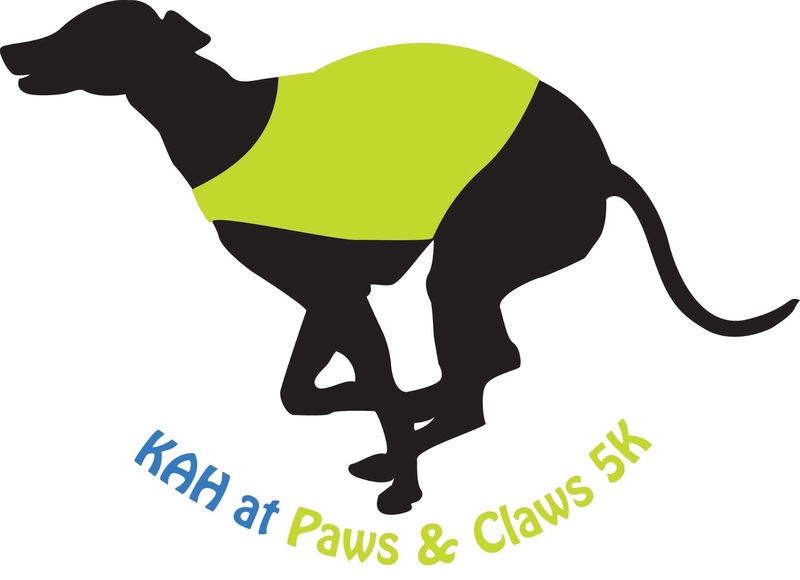 Kingsbrook Animal Hospital, your favorite veterinary team, is doing the AWL Paws and Claws 5k/1mile walk at Baker Park in Frederick, Maryland. Come join us in supporting animal welfare and fitness! Need another reason?….. Walking and running have many benefits, such as, weight loss, reduced stress, and reducing high blood pressure. The typical adult gains 1 to 3 pounds a year, which means they’re eating, on average, an excess of 10 to 30 calories a day. Walking 2, 000 additional steps a day would burn off the 100 calories needed to compensate for that excess calorie consumption. Studies show that walking or running is a proven stress management technique. It helps to take the mind off of stressful life situations and protects the heart from the harmful effects of stress. Additionally, walking or running helps to reduce high blood pressure by increasing blood flow and improving circulation. Regular physical activity makes the heart stronger. A stronger heart pumps more blood with less effort. When the heart works less to pump blood; the force on your arteries decreases, lowering blood pressure. So, what are you waiting for? 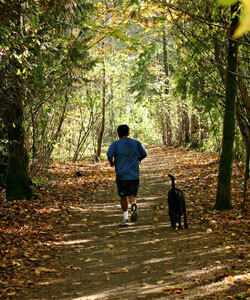 Grab a friend or your trusty dog and get active! Join us at Baker Park in Frederick, Maryland on June 29th, 2013! This entry was posted in Paws and Claws 5K on May 15, 2013 by yourfriends. Perhaps you already have a furry friend at home who would love to get out and have some fun with you. If not, maybe you have been considering adopting a dog. Local shelters are overflowing with animals that are in need of a loving home. If you are interested in a particular breed, there are many breed specific rescues. If you are unable to have a dog, consider exercising a dog owned by a friend or family member. Maybe they are too busy or not able to be more active with their pet. If they already exercise with their animal, consider joining them. Another option to consider is to become a volunteer at a shelter. By exercising the dogs as they wait for their new homes, they will be happier and in better shape, just like you! There are a variety of shelters in the Frederick Maryland area that would love your help. Start your own club with a group of friends or family. Being active is always more fun when your friends are involved! At Kingsbrook Animal Hospital, a few of our staff members run and walk together. With the upcoming Paws and Claws 5k, our goals have changed. We are slowly increasing our distance to be ready for race day on June 29th. To follow our training plan, check out the Kingsbrook Animal Hospital facebook page. 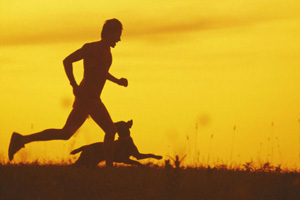 Before starting any exercise program, remember to first check with your doctor and your pet’s veterinarian. Always start slow and gradually increase the length of your activity. This will help to avoid injuries and ensure you reach your goal without frustration or worse yet… quitting! Remember, it should be fun for you and your pet! This entry was posted in Paws and Claws 5K on May 8, 2013 by yourfriends. Apps aren’t just for people anymore. Here is a roundup of popular pet apps for mobile devices. The cost of apps ranges from free to a few dollars. — Dog Park Finder Plus, a list of more than 6,000 dog parks and beaches in North America. Also lists 12,000 dog-friendly restaurants. — Find Pet Friendly Hotels, a list of over 10,000 pet-friendly hotels, along with weight limits, pet fees, dog parks and more. — Fido Factor, a mobile guide to dog-friendly locations. — Pet Poison Help, a quick list of poisons, what to do and how to get help. — Pet First Aid: for Your Dog, Cat, Puppy, or Kitten, a collection of videos and detailed instructions on what to do when caring for a pet. — Petfinder Mobile, the app of the popular pet-search website that includes more than 370,000 animals from 14,000 adoption groups. They will be releasing an Android app soon. — RSPCA My Pet, collection of information on how to care for animals from chinchillas to rats. — Picture-A-Pet SFSPCA, an adoption site connected to the San Francisco Society for the Prevention of Cruelty to Animals. — PetAdopt HD is a adoption site run by the North Shore Animal League America. — Lost Petz, allows people who have lost or been separated from their pets to issue an alert to others in the vicinity. — Game for Kittens, a chase-a-laser iPad game for cats and kittens. For the Android, which are sold through Google Play. Most range from free to a few dollars. — PetWise Mobile, a wealth of medical information for pets. — VetFinder, search engine for veterinarians and animal hospitals near you. — PetSaver, collection of care information for pets, such as pet CPR and first aid. — Petcentric, a guide to pet-friendly places. — Tropical Fish Guide Pocket Ed., the original Android pocket reference for freshwater tropical fish and plants. — Puppy Training, a guide for training a puppy. — Pet First Aid, information on emergency care. This entry was posted in App on May 1, 2013 by yourfriends.